Parish calendars: The 2015 parish calendars will be here this weekend. We have English-only and English+Russian church calendars with service and contact information for our parish. Suggested price is $10. Please put the money in the envelopes marked “calendar” or place in envelope and write “calendar” on it. The Sunday that falls between December 24-30 is known as the Sunday of the Holy Forefathers. These are the ancestors of Christ according to the flesh, who lived before the Law and under the Law, especially the Patriarch Abraham, to whom God said, “In thy seed shall all of the nations of the earth be blessed” (Gen. 12:3, 22:18). For all those travelling at this time, we pray for your safe return. On Fasting: an explanation of the fast can be found here. Questions about individual fasting practices should be discussed with Fr. Vladimir. The Nativity Fast has now begun. To the place where Christ is being born. Work bee: Thanks to all who participated. We appreciate your hard work! Feed Nova Scotia: We are collecting non-perishable food items for Feed Nova Scotia. If you have suggestions for other charitable outreach activities, please speak with Olha Kh. The Feast of the Entrance of the Most Holy Mother of God into the Temple will be celebrated Dec 6-7. Operation Christmas Child: Thank you to all who contributed items, money and time to pack the boxes. We set a goal of 10 boxes, we contributed 17! Thank you for helping to bring some comfort to children facing adversity. Feed Nova Scotia: Our next charitable outreach is collecting non-perishable food items for Feed Nova Scotia. There is a box under the table in the entrance. Many people in this region struggle with hunger, please consider how you might assist. Work bee: We will now have the work bee Saturday, Nov 22, starting at 9:30 am. There are many things to be done including: putting plastic on windows; close up some drafts around front entrance; parking lot work to remove large rocks; general cleanup; clean basement. Your help is needed. if you have any questions, please contact Luke or Dennis. Coffee and tea will be provided, please bring a lunch. Note that the celebration of the Feast of the Entrance of the Most Holy Mother of God into the Temple will be moved to the Dec 6-7 weekend. It is unfortunate that so often we tend to think of fasting as a negative aspect of the practice of our faith. True enough, fasting does mean giving up things, doing without foods which may be attractive and tasty, and indeed, one can understand the “negative” aspect involved. Yet, if we look at the fast from a different angle, we can see it as a positive thing, a good opportunity to free ourselves from some of the burdens and concerns of life. Tasty and delicious meals may be enjoyable, but they take work, time and money to put on our table. And for what purpose? It is certainly true that a good meal can be enjoyable, and from time to time there is no harm in this. But we must remember that the consumption of food is really not intended to be an occasion of entertainment and enjoyment, but a means of gaining the sustenance we need in order to keep our bodies strong and healthy. The healthiest and most nourishing foods are the natural ones, things which require very little effort to prepare and very little fancy processing. Such foods may have simple flavours, but those flavours are natural, coming to us directly from he Creator who planted them for our use. The simplicity of the Fast can free our minds from the concerns and efforts which so often go into planning and preparing meals; we gain leisure time to turn our minds and our hearts to other things. But what other things? Well, first and foremost we can concentrate on the reason for the Fast. We are approaching the Nativity, the event where time and eternity meet as our Lord and God enters into the world of time and space, becoming one with us in all our strengths, weaknesses, worries, cares, and joys. In no other religious tradition has the idea ever been broached that the Almighty and Eternal God would go to such lengths to unite Himself with mankind. This is what we are preparing for, and in the light of this great wonder, things like food and the other concerns of life become very unimportant. Consider the magnitude of the joy as Christ enters the world and becomes one with us, and at the nativity we are called to come and witness the miraculous birth. Should we not be eager and filled with joy at the thought that we are invited to encounter Christ in His birth? When the shepherds were told by the angel of the birth of the Christ, they immediately left their flocks and hastened to Bethlehem. And the Magi from the East joyfully undertook a long journey in order the see the newly born child. The journey and the rigours of travel meant nothing to them, especially when compared to the joy at the end of the journey. We can think of the fast as our joyful journey to Bethlehem. The very slight discomfort which might come from the absence of certain foods can be very easily replaced by the anticipation of the joy which awaits as at the end of the journey. A fast, even the strictest fast, always has an element of joy in it, for it leads to a feast and festival. And the Nativity is the first great feast of the Christian year a feast which reveals the inexpressible wonder of God’s love for his people and his creation. Let us, therefore, take the road to Bethlehem and use the Fast as our road map. Come to Bethlehem to worship the Christ, the Messiah, the Anointed of the Father, now made flesh and bringing into the world the fullness of the Spirit. No delay! The journey starts on Friday, November 28th. Start the course of the fast with joy, and end it with a joy greater than the mind can comprehend. The simpler food which we use during the fact will also cause a considerable saving in money. Why not use what is saved for the relief of the poor and hungry ... and there are many such even in our own area. To give to the poor during a fast period is a means of increasing our Nativity joy even more, for it means that in our small way we can thus share in the self-giving love of God. Note: Fr. Vladimir is away, but the monks will be coming to serve Liturgy. Confession is available starting around 9:30. Since we are having a Liturgy, this might change some plans around our work bee — more details to come. Operation Christmas Child — we have been collecting goods to fill 10 shoeboxes to send to Ukraine for children affected by the conflict. We’ve also collected cash for shipping costs. We now have enough cash to cover the shipping. So far, we’ve collected mitts and scarves, children’s clothing, various hair accessories, small toys, pens/pencils/crayons, toothbrushes, notebooks, hard candy and some soap. Additional contributions are welcomed (please stick to small items, the boxes aren’t big. Note that we cannot accept used goods. food or soft candy, decks of playing cards, toothpaste, liquids or creams, anything breakable, anything that could scare a child or become a hazard. Note: this Sunday is the only opportunity to bring items or contribute cash for shipping as we must bring the boxes the following week to be shipped. We will be packing the boxes during coffee hour on Nov 16th. Should we have extra items, we will group them and acquire additional boxes. Some items we need to complete the boxes: we need ziploc bags, we need some nice cards or note paper to include notes in the boxes. Additional plastic bags to pack extra items are also needed. If you can contribute these, please let me know. Thanks to all who are contributed to date. The enthronement of His Grace Bishop Ire’ne’e (Rochon) as Bishop of Ottawa and the Archdiocese of Canada will take place on November 29, 2014, at 10AM, at the Annunciation/St. Nicholas Orthodox Cathedral in Ottawa. Those planning to attend are asked to RSVP by November 15 to secretary@archdiocese.ca. Many years, Master! Shoebox gifts for Operation Christmas Child for Ukraine: Operation Christmas Child has been delivering shoe boxes to hurting and displaced children, because of poverty, war and disaster, around the world for over 20 years. This year, it will be sending 20,000 gift-filled shoeboxes to bring comfort and joy to children affected by the conflict in Ukraine. For more details, see Samaritan’s Purse. To make it easier for those who might not be able to pack full boxes themselves, we will collect donations this weekend for supplies. If you wish to contribute but won’t be at church this weekend, please let Nancy or Olha know the amount you wish to contribute so we can plan. A few of us will pick up supplies and boxes, and Nov 16, during coffee hour, we will pack boxes together. We hope to get enough donations to fill (and ship) 10 shoeboxes (shipping is $7/box). We’ll also have pens and note paper for those who wish to add personal notes of encouragement to these children affected by conflict. Further details will be coming. Through their website, you can also contribute cash towards the cost of a shoebox. Collection for Feed Nova Scotia: We are also collecting non-perishable foods for Feed Nova Scotia. Preparing nutritious food with limited access to fresh foods can be difficult. Please consider foods such as canned vegetables with no added salt, beans and legumes, whole grain products, soy/almond/rice milk, don’t forget baby food and formula too! Let’s ensure our donations make greatest possible difference to people. Most grocery stores also have collection boxes for food bank donations. Attendance at Vespers — Vespers is an integral part of our liturgical life. It is truly the beginning of Liturgy. It should not be a burden, but a joy. We are given not the obligation, but the PRIVILEGE of being in the presence of God and of the Risen Christ. We encourage you to make every effort to attend. Confession is another integral part of our spiritual life, and should be carried out on a regular basis. Confessions are heard Saturday before Vespers. Please contact Fr. Vladimir to schedule a time. St. Vladimir’s will have its Annual Parish Meeting on Sunday, October 19 after the Liturgy. We will be discussing our Parish’s business and future direction. We will be electing the Parish Council members for 2014-2015. This is also the opportunity for you to raise any questions or concerns that you may have. To confirm your membership and therefore to have the right to be a voting member at this meeting, please fill out the membership form as soon as possible. If you would like to become a member, please fill out pages 1 & 2. All information is kept confidential. If you are simply renewing your membership, please fill out page 1 only. If you have changed your contact information recently, you may also want to fill out page 2. Hard copies of the membership form will also be available at Church this Sunday, October 19. Happy Thanksgiving Day to all! Try not to overdose on turkey! For those who are travelling this weekend, we pray for your safe return. Our clergy, Fr. Vladimir and Deacon Alexander are also part of the council. Nominations can also be made at the meeting. If you wish to nominate someone, please make sure you have their permission. You will need a seconder. Please see Fr Vladimir if you have any questions about the nomination process. To vote, you must be an official member of the parish. Membership forms will be available at the meeting. Questions about membership should be directed to Leslee Mansour, parish president. Many delicious dishes will be served. For an extra donation, you can take home food. Containers will be provided. Please bring a dish to add the potluck and give generously. Sun Sep 21: Hours and Liturgy followed by coffee hour 10:00 am. A member of our parish has an urgent need. His niece Maria, a 26 year old single mother of a 5 year old boy who live in Ukraine, severely injured her leg in a fall last November, and has been on medication since then. She has been diagnosed with femoral head necrosis, a very rare diagnosis. Surgery is urgently required in the next month, or the only option will be amputation. Due to the current political instability in the country, it has not been possible for the family to obtain a bank loan to finance the operation. If you can assist financially, please donate at www.gofundme.com/egy4j0. Please pray for Maria and her family in this time of great need. Father Vladimir returns this weekend, and we’re happy to see him back! Sun Sep 14: Hours and Liturgy 10:00 am. We will have a potluck lunch to celebrate Fr Vladimir’s return, please bring a contribution. Please continue to pray for peace in Ukraine and the Middle East, and for Christians facing persecution throughout the world. Happy new school year to all our students! We pray that you have a productive and successful year. We pray for James as he’s away from us for another year in Peterborough, and welcome back to Catherine who joins us for another year at Kings! If we’ve missed anyone, welcome back to you, too! September brings us some changes. Last weekend was the last one with Frs. Cassian and Roman. We appreciate their service to the parish while Fr. Vladimir was off. Next week, we’ll have the great joy of welcoming back our pastor after several weeks’ recuperation. Please continue to pray for peace in the Middle East and Ukraine, and remember those who are persecuted for the Faith. Pray as well for the upcoming archdiocesan assembly Oct 2 in Ottawa, where we will nominate the candidate for Archbishop of Ottawa and Canada. Details can be found at http://archdiocese.ca/content/assembly-2014. Fr Dn Alexander and Luke Pitman will be our delegates. Safe travels to all who are going away for the long weekend! A Vigil and Liturgy for the Dormition of the Mother of God will held Wed Aug 27 at 4:00 pm. The Liturgy will begin around 6:30 pm. This is one of the great feasts of the church, please make every effort to attend. We understand many of you will only be able to join us for Liturgy. After the Dormition Service we will be having a potluck coffee/dinner. Over the past weeks, acts of incredible brutality have been committed against the Christians an other non-Muslim peoples if Iraq. Even Muslims who differ from the terrorists who call themselves ISIS have been subject to the same brutality. People are being slaughtered by the hundreds, and the killing is accompanied by the joyful laughter and mockery of their murderers. Even children have been beheaded and there severed heads displayed publicly. The Christian community in Iraq was one of the world’s most ancient Christian traditions. Now it is virtually nonexistent, as Christians have been slaughtered or forced to leave their homes and seek refuge elsewhere. Most of the refugees now realize that they never again will return to their homes. We are not taking about a few hundred refugees, buth rather thousands and tens of thousands. The ISIS terrorists seemed determined not to stop until every religious minority in Iraq is destroyed and all the people have accepted their brand of Islam with its harsh and cruel laws. “There are over 100,000 displaced Christians who have fled with nothing but their clothes, some of them on foot, to find asylum in the Kurdistan region,” a Chaldean Patriarch explained. However, those who make it to Kurdistan often find themselves without shelter or even water in the blistering heat. Thousands of other minority groups have also been targeted by IS, including ethnic Yazidis. Since their offensive attacks began in June, IS has ordered followers of Christianity residing in captured towns to either convert to Islam, pay a tax to remain in these communities as Christians, leave, or ultimately be put to death, usually by beheading. Christian believers apprehended by ISIS have been ruthlessly attacked or killed. Christians who are permitted to leave are ordered to leave all of their property behind. We may feel that this does not concern us, but indeed it does concern us deeply. Christians are all members of the body of Christ, and Christ stands for the salvation and redemption of the world and the eventual transforming of the Creation into the Kingdom of God. In the light of this, the Christian must show compassion with all suffering human beings throughout the world. There is, of course, suffering, war, persecution and chaos in so many places, far more than we can ever hope to cure. But nevertheless we must try. We should not have to be told to have compassion; compassion should be a natural reaction for every Christian. In the light of this, I strongly urge and beg people: Please open your hearts to those who are enduring such horror and chaos. There are different ways in which we can give to aid the victims in Iraq, but the organization known as The Voice of the Martyrs seems to be very effective. You can donate to this by making a contribution through the parish, and receipts for income tax purposes will be issued at the appropriate time. I truly believe that whatever people donate in love and compassion will, by God’s love and grace be multiplied like the loaves and fishes. Please, give generously, and your gift will be more than amply rewarded. News from Fr. Vladimir: He is pain-free and his recovery is going faster than expected. He still doesn’t know yet when he’ll be able to drive, he expects it’ll still be a few more weeks before he rejoins us. Please pray for the Treigers for safe travels. Please continue to pray for Fr Vladimir as he recovers from his surgery. Father Vladimir is now back home and is recovering well. Please continue to pray for him. Parish Potluck: If weather permits, we’ll have a potluck picnic outside, either at the chuirch grounds or at York Redoubt on Ferguson’s Cove Road (we’ll check with everyone after Liturgy to see what the consensus is). We have a barbeque, and hotdogs will be provided. Hopefully the weather will cooperate, there are some conflicting forecasts, but be prepared to be out in sunny weather. Bring bug spray, sunscreen, hats, etc. Please bring a food contribution to the potluck. Drinks and hotdogs will be provided. Cash contributions towards the cost of the hotdogs would be appreciated. We hope to see many people this weekend as we celebrate the blessings the Lord has bestowed upon us through the prayers of our heavenly patron, St. Vladimir. We will have a blessing of water Sunday after Liturgy. If you wish to take holy water home with you, please bring a very clean container, preferably one that has been soaked in hot and soapy water. Update on Fr Vladimir: Father is now out of the hospital and staying with a family until he’s able to fend for himself. Please continue to pray for his recovery. Sunday June 6, 10:00 am: Hours and Liturgy followed by coffee hour and work bee. Note that Fr Cassian will be at church for 9:00 to hear confessions. Liturgy will start at 10:00 am. Work bee: After coffee hour, we will be working around the church, cleaning, mowing lawns, yard work etc. Please stay if you can to assist in this. Note: These plans are dependant on the weather, as a tropical storm is forecast. Please check for updates before leaving for church in case it is necessary to cancel. You can follow the forecasts at weather.gc.ca. Be prepared and stock up necessary supplies in case you lose power. Sunday should be fine, but Sat Vespers might be impacted by the storm. Even if the grass should be too wet to mow, we’l still have a work bee after Liturgy, as there are still a lot of indoor tasks to do. Fr. Vladimir’s surgery went well. Please continue to pray for him as he does face several weeks of recovery. Work bee: After coffee hour July 6, there will be a work bee to get some chores done at church. More details to come. Please stay and help if you can. As we get into summer holiday season, pray for all those who are travelling, that they return to us safely. Thank you: A big thank you to Larissa for her help with the flowers at Pentecost. I don’t think there are any flowers left in her garden! The sale of the bouquets raised over 80 dollars for the Capital Campaign. Every bit helps! Also thanks to Maria and all those who helped to reorganize the kitchen. There are beeswax candles for sale in the entrance for home use. We continue to collect recyclables for refunds. At Pentecost, the tradition is to decorate the church with branches and greenery. A few of us will be at church starting at 4:00 pm on Saturday. If you’d like to bring some flowers or branches and help decorate, you’re welcome to join us. For those who’d like to have some personal flowers to celebrate the feast, there will be some corsages/posies available Sunday for a small donation towards the Capital Campaign. Fifty days after the Resurrection, on the Jewish feast of Pentecost, the Holy Spirit descended upon the Apostles in the form of cloven tongues of fire, with the sound of a mighty rushing wind, and they began to speak in languages that they did not know. There were many visitors from the Jewish diaspora to Jerusalem at that time for the Jewish observance of the feast, and they were astonished to hear these untaught fisherman speaking praises to God in many different tongues. The number fifty, as in the fiftieth day after Pascha, stands for eternal and heavenly fulfillment, seven times seven, plus one. The Orthodox Church sees Pentecost as the final fulfillment of the mission of Christ and the beginning of the messianic age of the Kingdom of God, mystically present in his Church. It is traditionally called the beginning of the One Holy Catholic and Apostolic Church. Besides celebrating the coming of the Holy Spirit, the feast also celebrates the full revelation of the Holy Trinity, Father, Son, and Holy Spirit. Hymns of the Church, celebrate the sign of the final act of God’s self-revelation to His creation. To Orthodox Christians, the feast of Pentecost is not just a celebration of an event in history. It is also a celebration their membership in the Church, as they have received “the seal of the gift of the Holy Spirit” in the sacrament of Chrismation. For the feast of Pentecost the icon of the Holy Trinity, the three angelic figures who appeared to Abraham, should be placed in the center of the church for veneration. This icon is used with the traditional Pentecost icon. The Kneeling Vespers are observed after the Pentecost Liturgy. This is a Vespers service to which are added three sets of long poetical prayers, the composition of Saint Basil the Great. Father Vladimir’s surgery got postponed. We are continuing to collect recyclables. You can either return recyclables yourself and bring the proceeds to church, or bring them to church (please remove caps and rinse them out), and Nancy and Therese will return them for refund. These candles are made in small batches by a parishioner of St Vladimir’s Orthodox Church using recycled, blessed beeswax. The beeswax comes from candle stubs leftover after services. The candle stubs are collected, cleaned, and melted down to liquid form. The melted wax is then re-formed with new wicks into a useable candle again. Please buy these candles for your home worship or other candle needs. The wax is blessed so please dispose of any leftover wax respectfully (not in regular trash) or return the wax to Juliana who will use it again.! ALL money collected from the sale of these candles goes to the Capital Campaign! Please note: As with all votive candles, to ensure they burn properly (and not quickly melt into a puddle) please burn them in a proper votive holder. We have authentic Ukrainian hand-painted wooden eggs (“Pisanki”) for sale, many colors and patterns to choose from, $5 each. They will be available for purchase until mid June. Please contact Alina or Ksenia. All proceeds will go to the Capital Campaign. For those coming from/through Dartmouth — Sun morning, the MacDonald Bridge and surrounding streets on both sides of the harbour will be closed due to the Bluenose Marathon. Plan your route accordingly. Confessions — this weekend and next will be the last chance for confessions for a few weeks. Father Vladimir will undergo knee surgery the week of May 26, and he’ll be off for a few weeks. Please pray that all goes well and that he has a speedy recovery. Metropolitan Boulos Yazigi, and Syriac Orthodox Archbishop Yohanna Ibrahim, both of Aleppo, Syria — last week marked the one-year anniversary of their abduction. Pray for their safe return. We hope you’ve all had a joyous Paschal celebration thus far. Don’t forget that this is just the beginning, the feast continues for several weeks. A lot of work goes into getting everything ready for Holy Week and Pascha. Thanks to Fr. 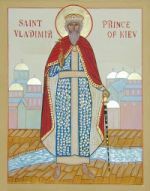 Vladimir, Fr. Deacon Alexander and the choir for all their work to ensure the services are celebrated. Thanks to all who cleaned the church and basement, set up the tomb and flowers, set up the kitchen and brought food for the celebration. Have a joyous bright week! If you wish to contribute towards flowers for Holy Week to decorate the church, please see Nancy. Confessions — there is not much time left to schedule confessions with Father Vladimir, please contact him as soon as possible. Note that no confessions will be heard past the afternoon of Sat Apr 19 (Holy Saturday). Confessions are mandatory to be able to receive communion at Pascha. Mon Apr 7: Divine Liturgy in the Hermitage of the Annunciation (New Germany), at 10am. Everyone is welcome. Other news: The newest member of the Iremadze family, Maryam, will be baptized this weekend. Her patron saint is St. Mary of Egypt. May God grant little Maryam many, many years! Father Maximos and the Antiochian Orthodox parish of St. Antonios (2455 Windsor Street, Halifax, NS B3K 5B9) are inviting all of us to join the celebration of the Vespers of the Sunday of Orthodoxy, this coming Sunday, March 9, at 5:00 pm. The Sunday of Orthodoxy is a wonderful occasion to celebrate the fullness of our unity as Orthodox Christians. It is very important for St. Vladimir’s to participate in the celebration of this unity, so if you are available this Sunday evening, please come. You’ve probably heard on the news how the unrest in Ukraine is growing, and there have been many deaths. There will be a panikhida after Vespers this Saturday for those who have lost their lives, as well as additional prayers during services. Please pray for the restoration of peace. бЕВМЮЪ ОЮЛЪРЭ! Memory eternal! Please note that Wed vespers will be cancelled for the next few weeks. During Lent we’ll have the Liturgy of Presanctified Gifts on Wednesdays. After Pascha, we’ll revisit the schedule of mid-week services. Sun Feb 16 — due to the flash freeze warning, the services are CANCELLED. Bottle drive — we continue to collect recyclables as a fund raiser for our capital fund. You can either bring your bottles to church (please rinse them and remove caps), or drop them off at a recycling depot and bring the proceeds to church (please mark bottle drive on the offering envelope so we can track it). Many years to the newly ordained Fr. Cassian and our Fr. Dn. Alexander! Thank you to all who helped with the set-up and food over the weekend. Your assistance is greatly appreciated! Please, pray for Maia and Maryam as they continue to rest and recover their energies. New 2014 liturgical calendars are for sale in the church now. We have English only and English/Russian versions, with the same colorful backer showing our new beautiful church on Purcells Cove Rd. Suggested price is $10. To pay for a calendar, please put your money in an envelope and place it in the donation basket. Please write on the envelope for how many calendars your payment is so that we could track them separately from regular donations. If you wish to take holy water home after the blessing of the water, please bring a very clean container, preferably that’s been soaked very hot, soapy water. Sunday Jan 19 — Hours and Divine Liturgy, with ordinations of Sasha Treiger to the diaconate and Fr. Cassian to the priesthood, followed by potluck meal at Purcells Cove Social Club 505 Purcells Cove Rd. Please keep Fr. Cassian and Sasha in your prayers as they prepare for their ordinations. Right after the Liturgy on Sunday, there will be a Panikhia service in memory of Alexander Strijak who died in Vancouver on Jan 7. Also, there will be a special donation backet for his family. Collection for ordination gifts: There is a basket for a collection towards gifts for Fr Cassian and Sasha for the occassion of their ordinations. Please make a contribution if you can. There are sign up sheets and the bulletin board for the Nativity meal, and for potlucks during the visit of His Grace Bishop Irénée for the feast of Theophany. Please sign up to make a contribution. Confession: Confession during the Nativity Fast is required to be able to partake of the Eucharist at the feast. If you have not already done so, please contact Fr. Vladimir as soon as possible to schedule a confession. Saturday and Sunday will be the last opportunities. For those from outside of Halifax might be able to make alternate arrangements, please speak with Fr Vladimir to discuss your particular situation. Parking: As you know, our parking lot is very small. For Nativity, we encourage car pooling where possible. We also ask that you park your vehicle in such a way as to allow for the most efficient use of the space. If there are no snow clearing operations, street parking is available on Fergusons Cove Rd. You can sign up for notifications from the city to know when the overnight parking ban will be enforced. Visit www.halifax.ca/snow/HRMsOvernightWinterParkingBan.php. If someone could volunteer to oversee the parking at the Nativity Vigil, that would be appreciated, please contact Nancy.